U.S. 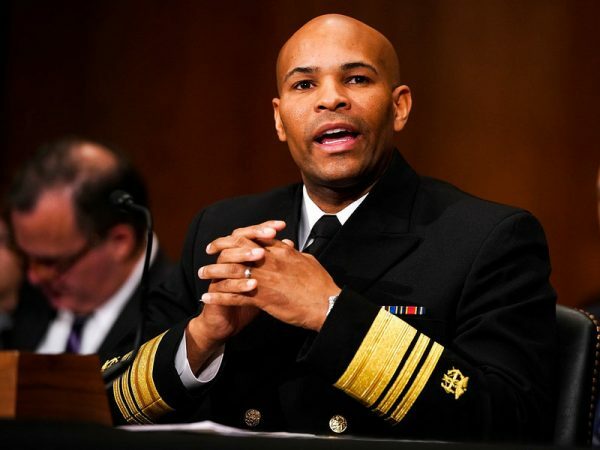 Surgeon General Jerome Adams visited Alaska in early August to talk about the significance of the opioid epidemic and strategies for ending it. More than 80 people died from overdose deaths in Alaska in the last 12 months. The number is declining as more and more people get access to Naloxone, the medication that can stop an overdose. He spoke with Anne Hillman of the Solutions Desk about some of his ideas. Dr. Jerome Adams: The opioid epidemic isn’t just a health problem or just a public safety problem. It’s a problem that touches everyone in our community. And, as I’ve traveled across the country the places that have had success are the ones that have brought together the faith-based community, the business community, the law enforcement community, and the health community, among others, to address this complicated issue. Anne Hillman: Do you see the opioid epidemic as the biggest health issue we should really be focusing on? JA: I think the opioid epidemic is the biggest health problem that we have. Number one because overdoses are rapidly increasing, but number two because it gives us an opportunity to talk about so many issues which plague our society. When you look at that untreated mental health issues, when you look at unwellness in our communities. All those lead into substance use disorder, and if we use this tragedy as an opportunity to address those upstream causes, then we’ll solve not only the opioid epidemic but so many other health woes that are affecting our country. One of the things I’m working on as Surgeon General is a report on community health and economic prosperity, helping communities understand that investing in health is also investing in jobs. It’s also investing in safety and security. It’s investing in the things that they care about and that they vote on. If we don’t invest in those things, it’s going to continue to be a drag on our economy, on our safety, on our ability to devote resources to the things that we care about. AH: You mentioned mental health issues. There’s a stigma around mental health issues. There’s a stigma around getting treatment, and there’s a lot of people who are trying to change that narrative. What are you doing to change that narrative? JA: I’ve often said stigma is one of the biggest risk factors and one of the biggest killers in our country. It’s why I share so openly the story about my brother Philip who suffers from substance use disorder and who is in prison right now. That’s the only way we’re going to overcome stigma is by helping normalize substance use disorder, normalizing mental health issues. Normalizing all sorts of ills. AH: Normalizing, as in, normalizing conversations around it? JA: Normalizing conversations about it and helping people realize that it’s not a sign of weakness to ask for help and to seek out treatment. AH: You mentioned that organizations need to be coming together and collaborating on providing treatment, not overlapping in what they’re doing. But some people say, ‘Well there’s not enough options out there right now.’ If you start pulling all these organizations together, aren’t you also just further limiting options? JA: One of the things we know is that there will never be enough money for us to spend our way out of this problem. But we do know that there are a lot of folks who are separately, independently, developing programs, and those programs aren’t talking to each other. I’m convinced that if we can form one or two or three really good programs instead of having 14 or 15 separate programs that we can spend our money more wisely. It doesn’t mean we don’t need more funding, but it means that we need to use every dollar that we have — every penny that we have — as wisely and as efficiently as possible, and we’ve seen many communities do that through partnerships. AH: You briefly mentioned that your brother is in is incarcerated. Are you also working with improving treatment during incarceration? JA: I just spoke to the American Corrections Association’s annual meeting, and one of the big things we talked about with the need to provide treatment for folks while they’re incarcerated. If we don’t do that then we just send them back out into society to the same risk factors, to the same individuals who got them in the situation in the first place, and we keep that revolving door going. I’m convinced that we can turn people into assets when we return them to their communities instead of returning them to the communities as burdens. But that’s only if we give them the treatment that they need, so that they can be successful when they come out. AH: So what can you, as a Surgeon General, do, other than promoting that message to actually have that happen? JA: Well, for instance, on the stigma front, we issued a Surgeon General’s Advisory regarding Naloxone, and Naloxone dispensing has gone up 40% in just the first month since that advisory. I’m using my opportunity, my bully pulpit, to help lower stigma, to help people understand that they all have a role to play, whether it’s carrying Naloxone or getting rid of unused medications in their house and responding to the opioid epidemic. We’re seeing a difference. I’m convinced that we’re going to get to where we need to be, but I want us to get to where we need to be in a way that prevents future disasters by building healthy communities.